Thistles are the thorn in the side of many gardeners. Some have nice sounding names, like blessed thistle, while others, like horrible thistle, hint at how difficult they are to eradicate. There are many types of thistles (not to be confused with invasive teasel), but they all share certain characteristics. The foliage grows in what's called a basal rosette - this means the leaves grow in flat, ground level clumps, radiating out from the crown of the taproot in the middle. Individual leaves can range from a couple inches to a couple feet in length, but they all have sharp prickers along the margins which make them very difficult to deal with. Thistles closely resemble dandelions, but with prickers. 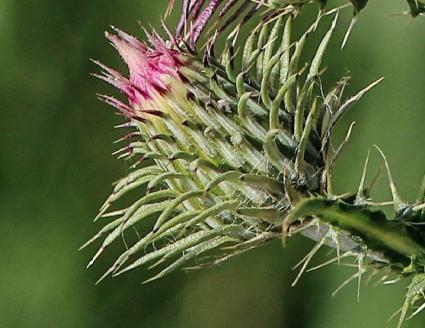 When treating a thistle infestation it helps to understand a few things about their biology. One, they like poor, dry, hard soil - places where few other plants thrive - and full sun. Two, they grow as a biennial. 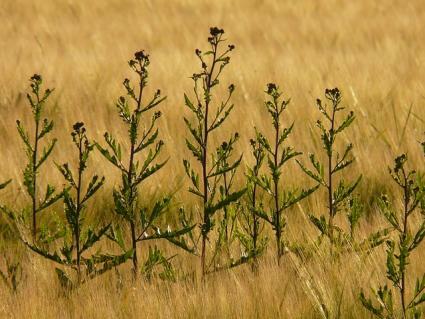 This means they form a 'basal rosette' of leaves in their first year and then send up flower stalks, set seed, and die in year two. An individual plant produces thousands of viable seeds, which is why they get established so quickly. Thistles are unlikely to become established in shady, moist gardens with rich, fertile soil. In other words, working toward a healthy, mature garden is the best way to prevent a thistle infestation. Since that can't be achieved overnight, there are a few things that can be done to get things moving in that direction and stem a thistle infestation before it gets a toehold. Mulch deeply - It's nearly impossible for thistles to get established in three or four inches of mulch and all that organic matter will eventually create spongy, fertile topsoil. Plant a dense groundcover - A dense planting of groundcovers can hold its own against thistles, especially if it's encouraged by lots of water and compost. Plant trees and shrubs - Trees and shrubs take a while to grow, but there's no time like yesterday to get started with a forest-like landscape, which will add great beauty to your property and reduce sunlight, precluding thistle establishment. 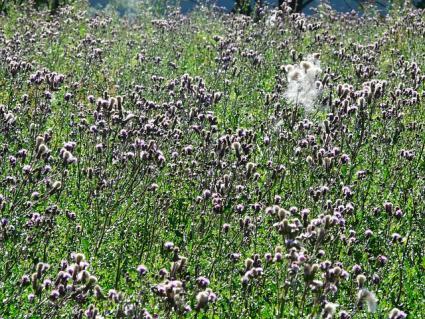 If thistles do get a foothold in the landscape, it's all about preventing them from setting seed, as they will spread exponentially year by year, covering any ground that is to their liking. On a small scale, it's worth trying to remove individual thistle plants. Their taproot doesn't make it easy, but it's less difficult after a rain when the soil is moist. Use a digging fork to gently pry up the soil around the plants in an effort to remove the taproot in one piece. Since taproot removal is slow-going if you have more than few plants deal with, another tactic is to quickly slice the taproot of individual plants several inches below the soil with a mattock or spade. They will eventually regrow, but will be weakened. As soon as they reappear, repeat the process and eventually the energy reserves in the roots will starve from lack of photosynthesis and the plants will die. Mow thistles just before they flower. The leaves of thistles stay so close to the ground that mowing isn't an effective way to remove them. Mowing is effective, however, when carried out after the flower stalks have formed but before they have set seed. The plant is nearing the natural end of its life cycle at this point and does not typically recover after being mowed - but you will have accomplished the all-important task of preventing seed set. If they do put up another round of flower stalks, keep mowing until they give up. Unlike mowing, herbicide applications are effective during the basal leaf stage (year one) of the plant, but are not much use once the plants have started to flower. Spraying herbicides is something that should be considered very carefully, since the chemicals can drift on the wind or be carried into waterways when it rains, causing ecological damage elsewhere. If you do choose to go the herbicide route, spray on a calm, sunny day and target individual plants as much as possible. 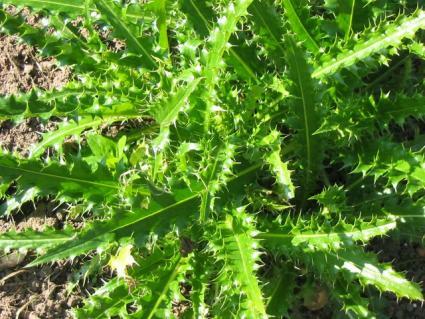 Glyphosate and other broad spectrum herbicides are effective on thistles, especially on the seedlings in early spring. Established plants with large taproots may sprout back after being sprayed, requiring a second round of treatment to be eradicated. It's difficult, but not impossible, to eradicate thistles once they've become established, though the best treatment is always prevention. Though they are pesky weeds, you can see them as a sign that the soil needs to be improved, as thistles thrive in the tough places where most garden plants struggle to get established.